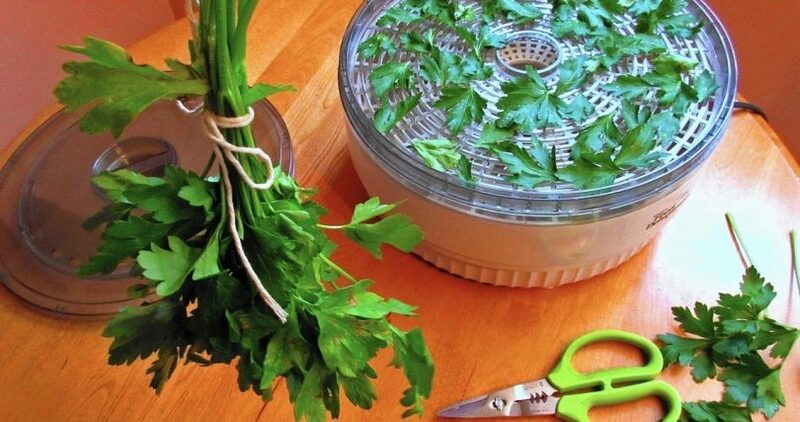 Drying parsley is not as difficult as some people think. Just about anybody who has an oven, a microwave, or a dehydrator can do it. You can even dry parsley by air drying it or putting it under the sun for several days. If you have more parsley than you can use right now, don’t hesitate to dry the surplus and store them. Dried parsley keeps for about a year. You can use it as you would fresh ones. You don’t need a lot of equipment to dry parsley this way. If you are using produce from your own garden, harvest the parsley at midmorning. Do not harvest during the early hours of the morning as the parsley are still likely to be a bit damp from the night dew. Group the sprigs loosely into bundles. Use rubber bands to secure the stems. Hang the sprigs upside down on your clothes drying rack. You can keep the rack in the porch, attic, or some other place that is warm and dry. The springs will be dry enough after about a couple of weeks. The leaves will be brittle when you touch them. Put the dried parsley on a piece of wax paper. Use your hands to gently separate the leaves from the tough stems. Store the dried parsley in an air-tight container. You don’t need any special equipment for this method, either. You just need a baking sheet and some old window screens. However, the day needs to be just right. Choose a bright, hot, sunshiny day for drying parsley. Otherwise, the parsley will not dry as it should. Measure and cut them to fit your baking sheet. Put the parsley on top of the screen. The screen ensures that the air flows freely around the parsley. Put the baking sheet in your porch or some other similarly warm area. Check the parsley. Turn the sprigs over so that each side gets an even tan as it dries. Drying time will depend on where you are and how much sun you get at home. The parsley may be dry enough to keep at noontime – or you may need a couple of days or more to complete the drying process. Bring the baking tray in when the sun sets so that you don’t get any dew on the parsley. Continue sun drying the next day. Wash fresh parsley using cold water. Remove the tender leaves from the woody stems. Give the leaves a rough chop. Blanch for about 15 to 25 seconds in boiling water. Rinse with cold water to keep the parsley from continuing to cook in the residual heat. Cover a baking sheet with brown paper. Position the blanched parsley on the tray. Keep them evenly spaced and flat. There should be no big clumps. Put the tray in the oven. Use the lowest setting so that you don’t burn the parsley. Keep the parsley in the oven from between 2 to 4 hours. The speed by which the parsley dries will depend on factors like humidity and altitude. Check the parsley on a regular basis. It is dry enough when you can easily crumble it in your fingers. Take the dried parsley out of the oven. Check for stalks that you may have overlooked. Get rid of them. Crush the dried parsley using a mortar and pestle. You may also crush the parsley using your hands. Store the crushed dried parsley in an airtight jar. Store the jar in the freezer or in a dark, dry area. If you are new in blanching parsley or any other herbs, watch the video. The plant tissue has it a bit easier when you dry it through a microwave, instead of in an oven. In microwave drying, the water that the parsley contains gets most of the energy that the microwave produces. The water heats up and evaporates. The plant tissue may also heat up a bit because of the water it contains. The water, however, soaks up nearly all of the heat. Using the microwave method for drying parsley, thus, enables the parsley to retain most of its color and potency. It is also extremely easy and fast to dry parsley in the microwave. You just have to carefully arrange the leaves on the microwave plate, slide the plate back into its place, and nuke. You have dried parsley within seconds! Cover the microwave glass plate with paper towel. Put the parsley on the towel in a single layer. The outer edge of the plate is the hottest part so lay out the thicker and larger leaves in this section. Get another paper towel and put it on top of the parsley. Turn on the microwave. Nuke the parsley on high for about a minute. Check the parsley. If they are not dry enough, keep nuking in 20 or 30- second intervals. Dehydrators are a bit expensive. But they are easy and convenient to use. They are also very effective for drying food. If you always have a lot of fruit, vegetables, or herbs that you want to dry, you may want to invest in a dehydrator. A dehydrator uses hot air. It removes moisture from food in a gentle and slow manner. A dehydrator comes with trays with small perforations or holes in them to facilitate the circulation of the warm air essential for drying food. Preheat the dehydrator according to the manufacturer’s instructions. Dehydrators may differ. Check the manufacturer’s recommendation for the appropriate drying time for parsley. Put the fresh parsley on the dehydrator trays. Use single layers. See to it that the layers do not overlap. Otherwise, the parsley may not dry properly. Keep the parsley in the dehydrator for the time specified by the instruction manual. Drying time may take as long as 4 hours. Dried parsley is best stored in containers with airtight lids. Glass containers are a good choice. Mason jars make fine containers, too. You can even use reclaimed glass containers as long as they come with airtight screw caps. Always store dried parsley away from heat. Keep your jars in a cool, dark place. Dried parsley keeps for a year. You can still use them after a year but they will not be as aromatic. If you have a really profuse harvest, you can opt to store your dried parsley in freezer containers. Keep the containers moisture-free and the dried parsley will remain aromatic even after a year and a half in the freezer. Drying parsley is a great way to extend your harvest. You save money and still enjoy the optimum flavor.